NEWS24 Head of Current Affairs and Dhaka University Mass Communication and Journalism Department Associate Professor Samia Rahman poses for a photo after inaugurating a new cylinder of Bashundhara LP Gas at the conference room of Bashundhara Industrial Headquarters-2 in Bashundhara Residential Area in the city on Wednesday. 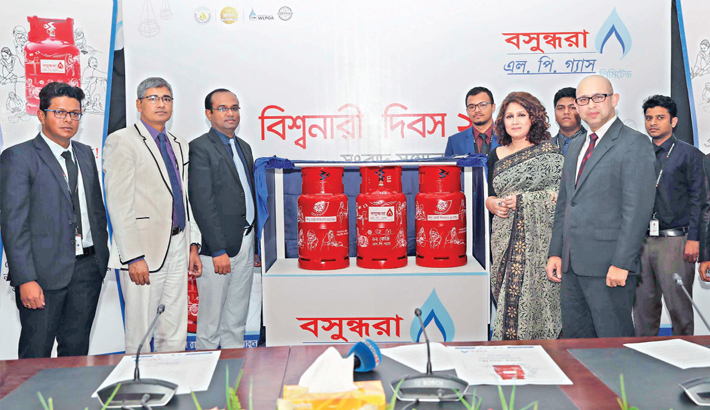 Bashundhara LP Gas Ltd, a concern of country’s largest business conglomerate Bashundhara Group, has introduced a new gas cylinder with sketches depicting women’s involvement in household and other economic activities. NEWS 24 Head of Current Affairs and Dhaka University Mass Communication and Journalism Department Associate Professor Samia Rahman inaugurated the new cylinder at a press meet at Bashundhara Industrial Headquarters-2 at Bashundhara Residential Area in the city on Wednesday. Samia Rahman said Bashundhara Group LP Gas holds a strong position in the market with a number of diversified products. She said the company has now taken initiatives to pay due tributes to women highlighting their contributions to the society. This new product, she said, will help bring more respect for women through the sketches portraying various activities of womenfolk, she added. The NEWS 24 head of current affairs suggested offering 5-10 percent discount to women customers. Samia Rahman advised Bashundhara LPG to develop their advertisements with real experiences from customers’ kitchens. Bashundhara LPG Ltd Head (Marketing) MM Jasim Uddin said Bashundhara LPG has become a part of people’s daily life. At present more than 85 percent of the women users choose Bashundhara LPG. The company has taken the initiative to pay tributes to the women to mark the International Women’s Day, he added. He announced that the company will provide large-scale recognition to women during the LPG company’s 20th founding anniversary celebration. Bashundhara Group Head of Business Development ZM Ahmed Prince, Bashundhara LPG Ltd Head of Accounts and Finance Mahbub Alam and GM (Sales) Zakaria Jalal spoke at the event.